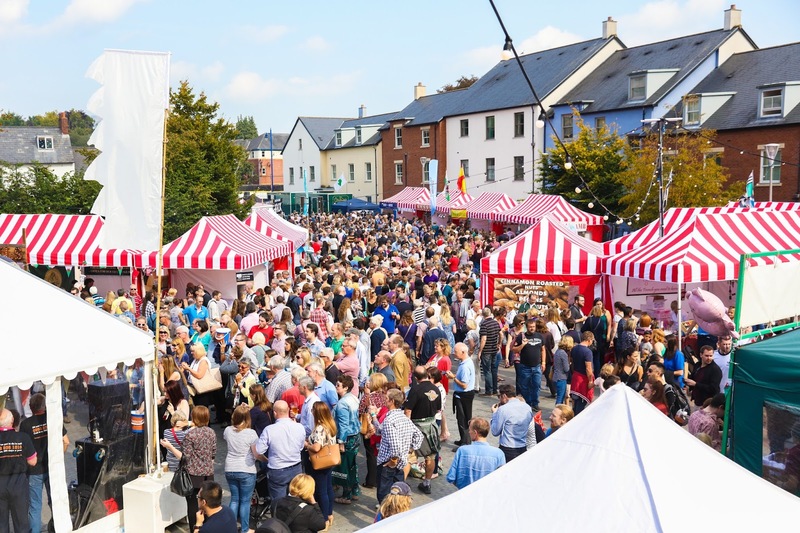 In just over three months time one of the biggest food festivals in the UK is due to return! Although I had heard many good things about Abergavenny Food Festival I had never been, that was until last year. Here I recount my experience as a festival first timer. I cannot stress enough how easy it was to get to the festival from Cardiff. Mrs Clonc and I caught the train from Cardiff Central direct to Abergavenny, it was then a mere 10 minute jaunt into town. Perfect. We got there early doors and that would be my top tip for anyone wanting to attend the festival as it gets A LOT busier later, that is unless you like queuing for food. We had a good look around and then decided what we wanted to buy and eat. There is nothing worse than buying/eating something only to realise there is something even more awesome around the corner! I have to say the set up in the castle was probably my favourite. So beautiful and atmospheric. It's here we had the most amazing calamari from the excellent Cafe Mor, winner of BBC Radio 4's Best Street Food 2014. Crispy coating giving way to melt in the mouth squid, insanely good! This was accompanied by a Smoked Bloody Mary cocktail made by the fabulous team from Chase. The vodka they make comes from potatoes and their classic vodka was voted best in the world. For the limited edition smoked vodka, water sourced from their own borehole is sat in the coolest part of the smokehouse for 5 days to pick up the distinctive smoky taste and then blended with their award winning Chase vodka! The smoky flavour totally comes through but is not overpowering and is a nice twist on a classic cocktail. 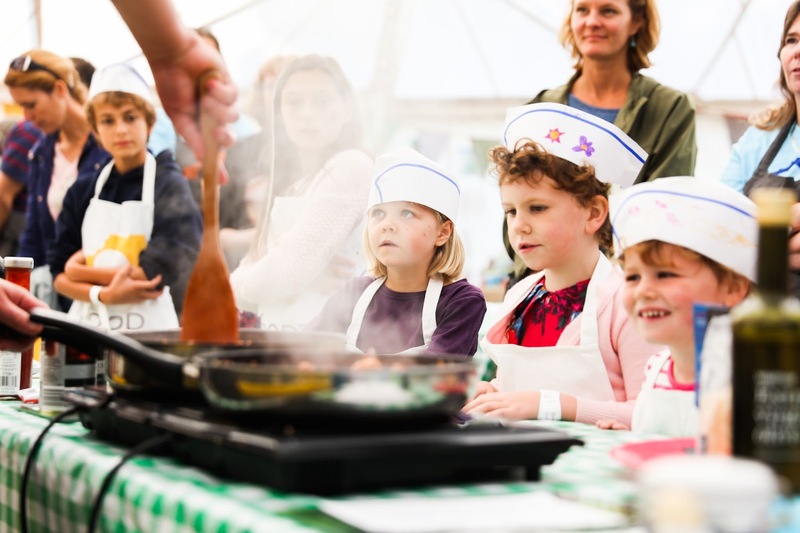 I also loved The Dome in the castle grounds which was home to the Children's Food Academy with a series of free workshops. So plenty to keep the kids entertained. The Market Hall packed full of stalls with amazing products and a stage for demos should keep the grown ups entertained! Ambling along we spotted the infamous Onion Man and then gorged on a Seville Orange Chocolate Brownie with chocolate sauce from The Chockshop, which had a stand literally stacked full of brownies of all varieties. One slip and there would have easily been a brownie avalanche! We rounded off the day with a Theo Randall masterclass at the Borough Theatre. 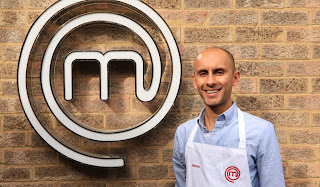 The Masterclass is a chance to catch your favourite foodie personalities in either conversation on stage or as in this case demonstrating their recipes. Others who graced the Borough Theatre stage over the weekend included Raymond Blanc and Yotam Ottolenghi. 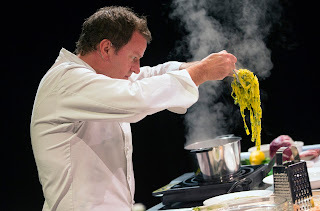 Theo Randall was showcasing recipes from his new book 'My Simple Italian'. It was both an entertaining and informative show from a man that has obviously done a few of these gigs before. It must be said that we loved just wondering around all the festival venues, soaking up the atmosphere (and some drinks) and chatting to people. Everyone was so friendly. I don't know if it was the glorious sunshine we had, the amazing array of food and drink available or that it is such a well organised event but Abergavenny Food Festival is now for me a must every year. 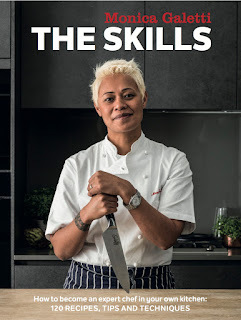 This year is set to be as brilliant as ever with headliners including Monica Galleti, fresh off the set of MasterChef: The Professionals (I love her!) 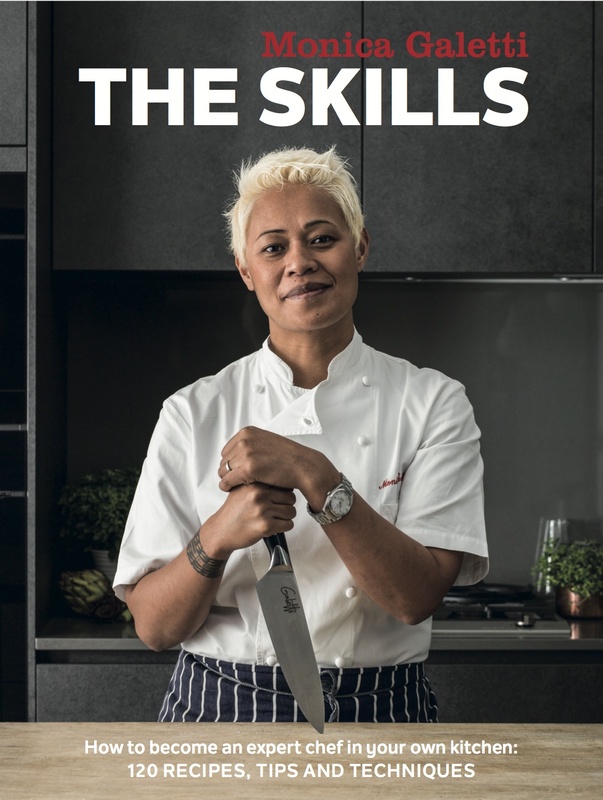 and exclusively showcasing her book 'The Skills'. 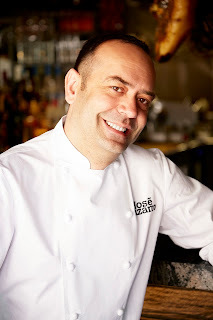 Joining her will be one of the Basque country's most well known chefs, the critically acclaimed and award winning Jose Pizzaro. The main man of Indian cookery Cyrus Todiwala will also be back again for his 14th festival appearance. 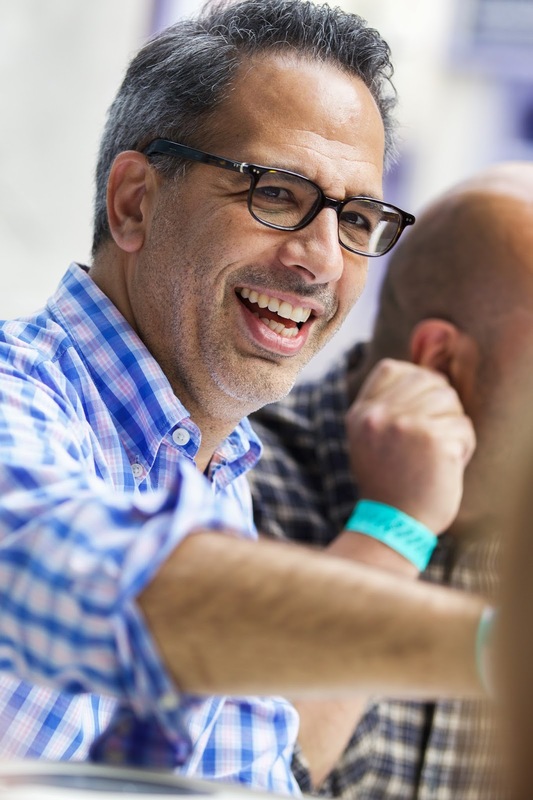 This man is a force of nature and I had the great pleasure of meeting him last year. He will be bringing his new book 'Mr Todiwala's Spice box ' to Abergavenny. Jane Baxter will be be back too for her 10th appearance promoting her new book Leon: Happy Salads. Essentially if you have not been before, trust me you are missing out! But here is a chance to win a pair of weekend wristbands for this years festival! Simply 'Like' my Facebook page and 'Share' the competition post or if you are on Twitter 'Follow' and 'Retweet' the competition post. The competition will run from the time this is posted to midnight on Friday the 17th of June. A winner will be chosen at random (names out of a hat, literately) and announced on the 18th of June 2016. Photos courtesy of Huw John and Cowshed. Oscars needs very little introduction, this venue has been synonymous with dining out in Cowbridge for over a decade and following an extensive refurb and menu revamp I paid a visit to see what I’ve been missing out on. Walking up to Oscars I was impressed with the curb appeal of the place. The eye catching colour scheme and large inviting bay windows certainly draws your attention to it. The interior doesn’t disappoint either. The refurb is nothing short of excellent. Having only seen photos of what it used to look like, my only question is what took them so long? 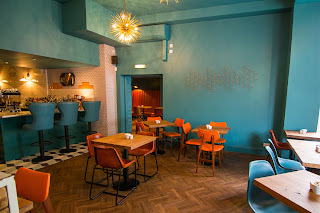 The teals, oranges, geometric patterns, tiling, lighting and copper cladding all just work so well. I would easily want my own front room decked out in a similar fashion. Also a fantastic example that chic and stylish does not mean lots of grey and industrial lighting. So refreshing to see such bold use of colour in a restaurant. We were greeted like long lost friends as we entered the restaurant by the front of house with the warmth and sincerity that made us feel instantly comfortable. Shown to our table we were promptly given the lunch menu. The varied and extensive day menu covers the 11am to 6pm slot before the evening menu comes into play. Therefore brunch options, to light lunches, three course meals to cakes and coffees are all catered for. With so many tempting menu options and the fact that Mrs Clonc and I rarely have a child free meal out any more we decide to go all out. A rather excellent virgin mojito for Mrs Clonc and a ‘Cardiff Dry’ Gin and tonic for me got our appetites going for the oncoming feast! To start Mrs Clonc opted for the Filo Crumbed Prawns (£7.95) and I went for the Crispy Seasoned Chicken (£6.25). The large prawns arrived studded in an armour of filo, each cooked perfectly. The prawns still nice and juicy with the added crunch of the pastry for texture. It was accompanied by a sweet chilli sauce and a pickled cucumber salad which complemented the prawns well. The chicken was spot on too. Beautifully presented flavoursome strips of highly seasoned and spiced chicken that was gnarled at the edges and delicious. However I didn’t think the feta worked well with the chicken. Aside from that both hit the mark and would easily work well as a light lunch on their own. But we were in no mood for a light lunch! Bring on the mains! There are some great main options on the varied menu that has kept its core Oscar classics but introduced some new additions too. 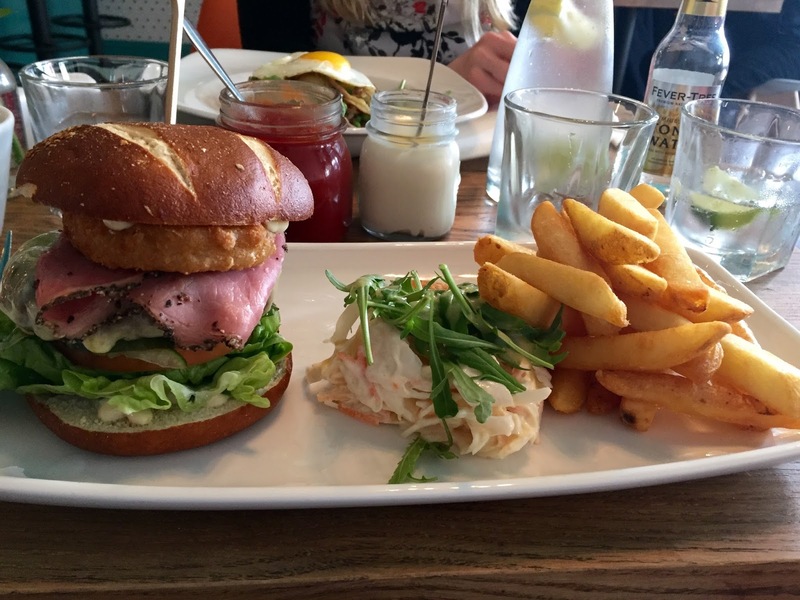 Everything from wraps and flat breads to salads to more substantial burgers and ‘chef’s choice’ options such as minute steak to Gower coast mussels. The Duck Hash (£11.50) took Mrs Cloncs’ fancy, while I was all about the Oscars Ruben Burger (£12.95). The hash comprised of shredded duck, pea and potato hash, onion chutney and topped with a fried egg. The duck was unctuous and rich, sweetened by the peas and onion chutney. The potatoes provided the bulk while the egg enhanced the richness of the dish. Delicious and very filling. Meanwhile I prepared for my encounter with the Oscars Ruben Burger! Just look at the photo! 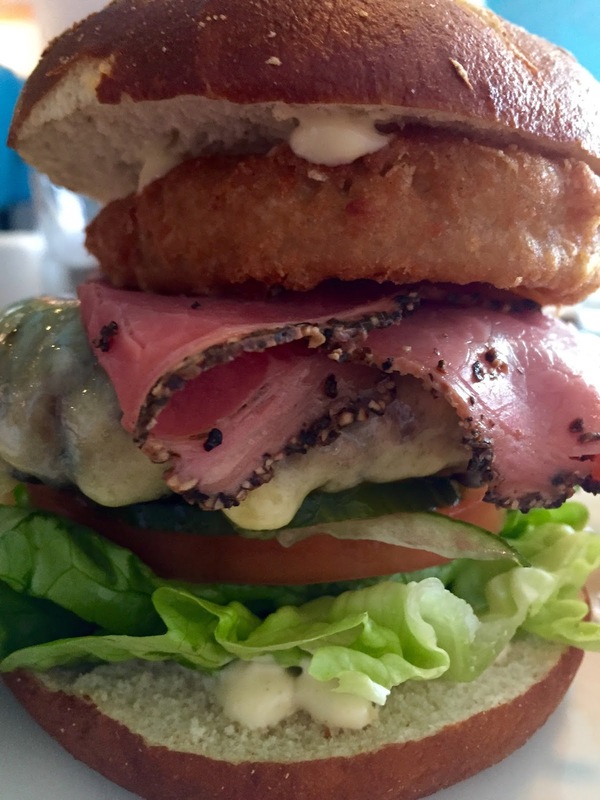 This gargantuan burger inspired by the New York classic and comprising of a 100% steak mince burger, topped with smoked cheddar cheese, pastrami, onion ring, mustard mayo and sat on top of lettuce, tomato and pickled cucumber all in a Pretzel bun! Top tip here is remove the tomato and salad from underneath the burger to stop the whole thing sliding out from in between the bun when you pick it up! Well it tasted brilliant, each component bringing something to it. Well seasoned thick patty, crunchy onion ring, oozing cheese and a peppery tang from the pastrami. A meat lover’s dream and definitely one to go for if you are super hungry! However the patty was too dry for my liking and cooked well done. Again I understand why chefs and restaurants choose to do this but the proof is really in the eating. That being said the Pretzel bun was a welcomed change from brioche and the skin on chips were excellent, crispy on the outside, fluffy in the middle and well seasoned. Now we were at the point of no return, go hard or go home! We chose to push on and ordered desserts. The selection of desserts certainly has something for everyone but there are two stand out options; the Warm Brownie Sundae (£6.00) and the Oscars Mess (£6.00). 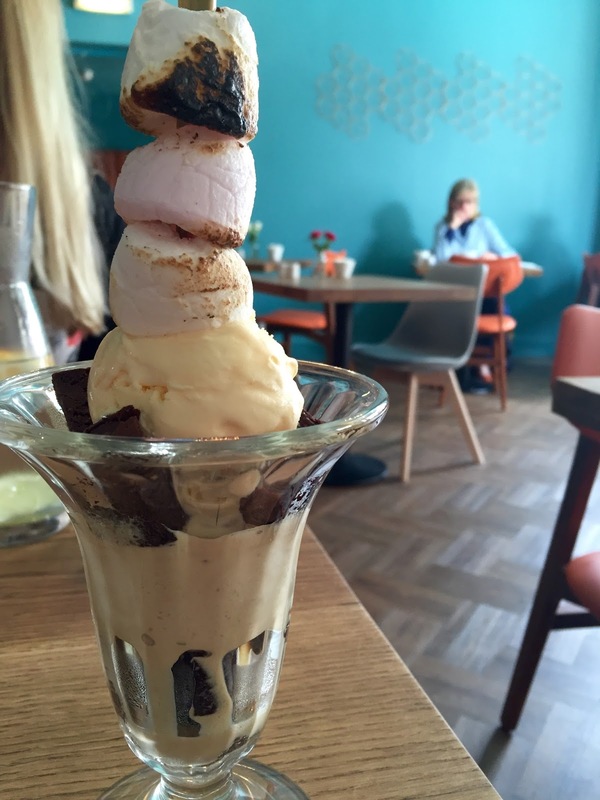 The sundae arrived with a skewer of gooey toasted marshmallows and layers of salted caramel and vanilla ice cream with broken up chunks of warm chocolate brownie. It was pure, unadulterated and over indulgent joy in a glass. The Oscars Mess on the other hand was that dish which catches peoples attention, leaving everyone with order envy. A mound of rose scented cream, broken meringue and strawberries topped with a toupee of bright pink candy floss. This dessert was as delicious as it looked, cream and strawberries what’s not to like and the candy floss was a lovely bit of fun and nostalgia. Full doesn’t even begin to describe how we were feeling at this point! I must say all the plates of food were thoughtfully presented with a sense of style and seriously photogenic! The portion sizes were generous too. The service was top draw. Professional and efficient with attention to detail. For example being asked if we would like our coffees/teas before, with or after our desserts. Also little touches like how well we were greeted and if one of the front of house was free and could see people getting ready to leave they would make their way to the door and open it for the exiting guests while wishing them a good day. Lovely and the kind of thing that people remember. 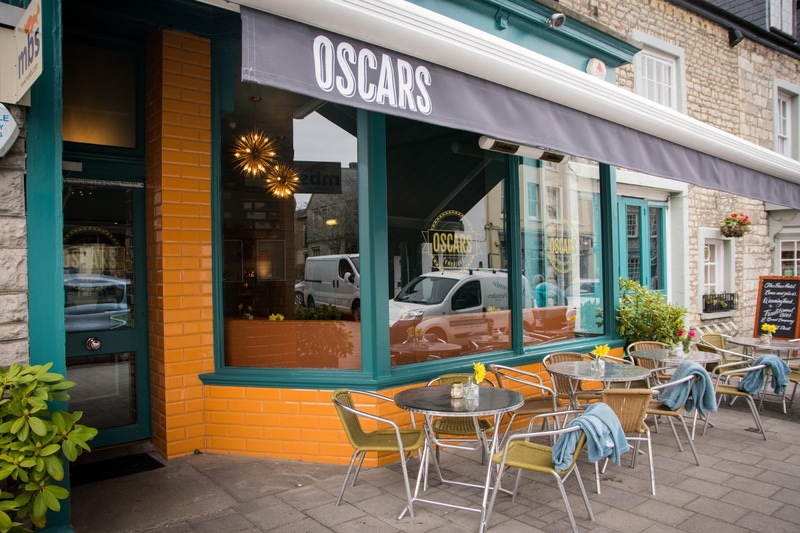 We had a brilliant lunch at Oscars of Cowbridge. Love the refurb, love the service, love the atmosphere, good food in a great environment. I can highly recommend a visit next time you find yourself in Cowbridge. All food and drink was complementary but this did not influence the review.